We want you to choose the vehicle that works best for you. First consult with one of our sales staff to assure that the vehicle you want can be converted to meet your needs. We can convert your own non-accessible vehicle or a new or used vehicle with a ramp, swivel seat, or a lift. Freedom Wheels is co-located with IDS (Independent Driving Systems), a company founded in 1996 to develop driving systems for individuals with severe impairments. This relationship makes Freedom Wheels a unique place to get your vehicle modified because we have direct access to the latest and best in driving systems available on the market. Please visit our video gallery, meet some of our customers, and see our technology in action. 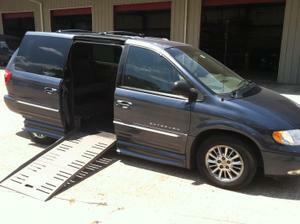 Through our direct-entry design you can ride in or drive from your wheelchair. Each vehicle is designed to assure maximum usability of space. We retain as much of the OEM features, including seating, as possible. We can position the ramp, swivel seat or lift so you can pull your wheelchair directly into the passenger or driver's positions with minimal maneuvering.